EDWARD LEE ELMORE turned 53 in January. For more than half his life, the soft-spoken African-American who doesn’t understand the concept of north, south, east and west, or of summer, fall, winter and spring, was in a South Carolina prison, most of it on death row. Edward Lee Elmore was in prison for 30 years, convicted of a crime that the evidence strongly suggests he did not commit. On Friday, Mr. Elmore walked out of the courthouse in Greenwood, S.C., a free man, as part of an agreement with the state whereby he denied any involvement in the crime but pleaded guilty in exchange for his freedom. This was his 11,000th day in jail. 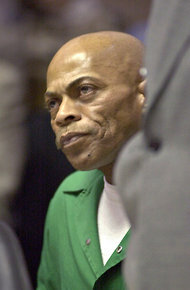 Mr. Elmore was convicted in 1982 for the sexual assault and murder of an elderly white widow in Greenwood. His trial lasted only eight days, including two spent picking the jury. The state concealed evidence that strongly pointed to Mr. Elmore’s innocence and introduced damning evidence that appears to have been planted by the police. For three decades lawyers for Mr. Elmore, who were convinced of his innocence, sought to get him a fair trial. Headlines and news stories about men being released from death row based on DNA testing suggest that this happens often. But it doesn’t. Once a person has been convicted, even on unimaginably shaky grounds, an almost inexorable process — one that can end in execution — is set in motion. On appeal, gone is the presumption of innocence; the presumption is that the defendant had a fair trial. Not even overwhelming evidence that the defendant is innocent is necessarily enough to get a new trial. “Due process does not require that every conceivable step be taken, at whatever cost, to eliminate the possibility of convicting an innocent person,” Justice Byron R. White wrote for the majority in a 1977 case, Patterson v. New York. In other words, innocence is not enough. I came to the Elmore case indirectly during the 2000 presidential campaign. On “Meet the Press,” George W. Bush, who as governor of Texas had presided over more executions than anyone in history at the time (Rick Perry has surpassed him), told Tim Russert that he was confident that every person who had been executed or placed on death row in Texas under his watch was guilty and had had a fair trial. This led to a reporting assignment in which a New York Times colleague, Sara Rimer, and I wrote about capital punishment, starting in Texas and then ranging from coast to coast. It was an eye-opening experience. But no case grabbed me like Mr. Elmore’s. It stands out because it raises nearly all the issues that shape debate about capital punishment: race, mental retardation, a jailhouse informant, DNA testing, bad defense lawyers, prosecutorial misconduct and a strong claim of innocence. Few men on death row are without any connection to the crime for which they are condemned to die. Their conviction might be reversed after an appellate court finds they were denied due process or didn’t receive a fair trial. Other death row inmates may not be guilty of murder, because they didn’t pull the trigger though they were present during the crime. But in the case of Mr. Elmore, I am convinced beyond a scintilla of a doubt that he had nothing to do with the Greenwood woman’s death. His conviction resulted primarily from a rush to judgment — and flagrant prosecutorial misconduct. Mr. Elmore, who grew up in abject poverty as the 8th of 11 children born to a tenant farmer’s daughter, was arrested 36 hours after the body of 76-year-old Dorothy Ely Edwards was found in her bedroom closet. Mr. Elmore had occasionally washed windows and cleaned gutters at the woman’s house, the last time two weeks before the murder. Less than 90 days after the body was found, his trial began. During his opening statement, the prosecutor, William Townes Jones III, a courtroom legend, said that 53 hairs had been gathered from the victim’s bed, where the sexual assault supposedly took place, and that most were the defendant’s pubic hairs. It was the only physical evidence that put Mr. Elmore inside the house at the time of the crime. “That’s what convicted him,” said a juror. “The total count on the hairs is 49,” answered the agent, Earl Wells, and he added that there were only 42 in the bag, because he had taken seven out for examination. Mr. Elmore’s lawyers made nothing of this discrepancy during their cross-examination of Mr. Wells, or in their closing argument. The state’s own inability to agree on how many hairs were found wasn’t the only suggestion of foul play. State Exhibit 58, the baggie with the hairs, wasn’t sealed. Which means that the hairs could have been put in by anyone at any time, and could have included those yanked from Mr. Elmore’s groin at the police station after he was arrested. Further, the bed barely featured in the police investigation. Investigators from SLED took nearly a hundred pictures at the house. They took pictures in the guest bedroom, where nothing had happened — even the small figurines on the bureau had not been knocked over — and of the bed in the guest bedroom, which looked as if it was ready for the next guest. But the investigators took no photos of the bed where they claimed to have found hairs. The state argued that while the police might have made some mistakes, none served to deny Mr. Elmore any of his constitutional rights. The hearing judge adopted the state’s arguments verbatim and declined to grant Mr. Elmore a new trial. Perhaps Mr. Elmore’s only good fortune was that on appeal he had on his side two determined appellate lawyers, Diana Holt, who had first begun working on the case as a law school intern, and J. Christopher Jensen, an accomplished New York litigator who was representing Mr. Elmore pro bono. Two years later, they turned up new evidence that the state had sought to hide and that pointed to Mr. Elmore’s innocence. In the 1963 landmark case Brady v. Maryland, the Supreme Court ruled that the state must turn over all potentially exonerating evidence to the defendant. But Mr. Jones did not give Item T to Mr. Elmore’s trial lawyers. More shocking still, Item T disappeared. The retired F.B.I. agent retained by the state to examine the hair said it was not “Negroid,” but Caucasian. Mr. Elmore’s lawyers had the hair DNA-tested. It wasn’t Mrs. Edwards’s, which suggested it was from an unknown man, likely the killer. Armed with this development, Mr. Elmore’s lawyers went back to court. There was a hearing, a few days before Christmas 2000, in the same courtroom where Mr. Elmore had been convicted 18 years earlier. It was widely expected that he would get a new trial. The judge ruled against him. “One hair is not enough,” he said. Spectators gasped. But the South Carolina Supreme Court agreed. Mr. Elmore’s lawyers did not give up. Remarkably, in November, the Fourth Circuit Court of Appeals — historically one of the most conservative — ordered a new trial. In a 163-page opinion, the majority was searing in its criticism of the SLED agents and the police. There was “persuasive evidence that the agents were outright dishonest,” and there was “further evidence of police ineptitude and deceit,” Judge Robert Bruce King wrote. Even though he walked out of court on Friday, none can call it justice. A man has served 30 years for a crime he did not commit, many of those under the threat of imminent execution. Surely, there are grounds for a Justice Department investigation into whether his civil rights were violated.